I haven’t changed up our mantel in a while and am getting the itch to do a little rearranging. 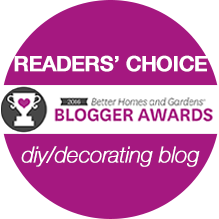 Right now, it’s simple and straightforward, with a pair of ginger jars flanking the DIY art I made. 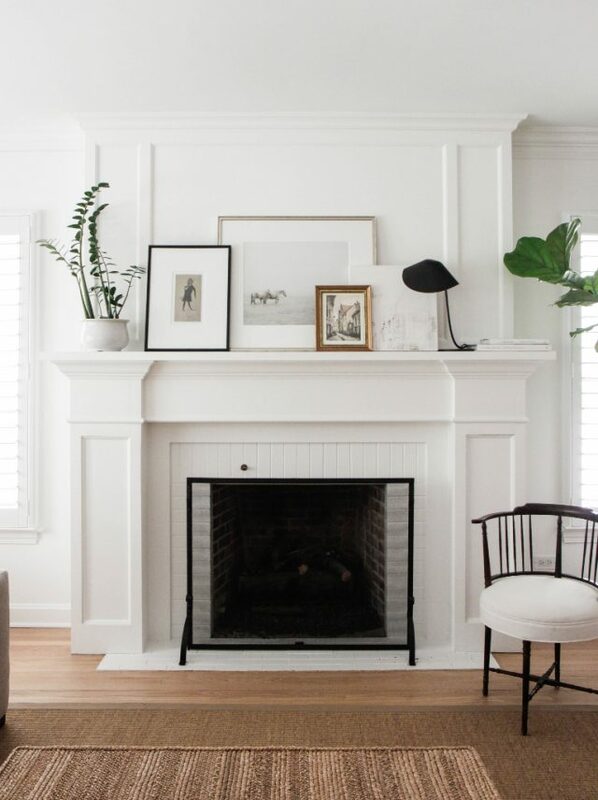 Here’s the way it looks currently, along with two more mantel decorating ideas I like. 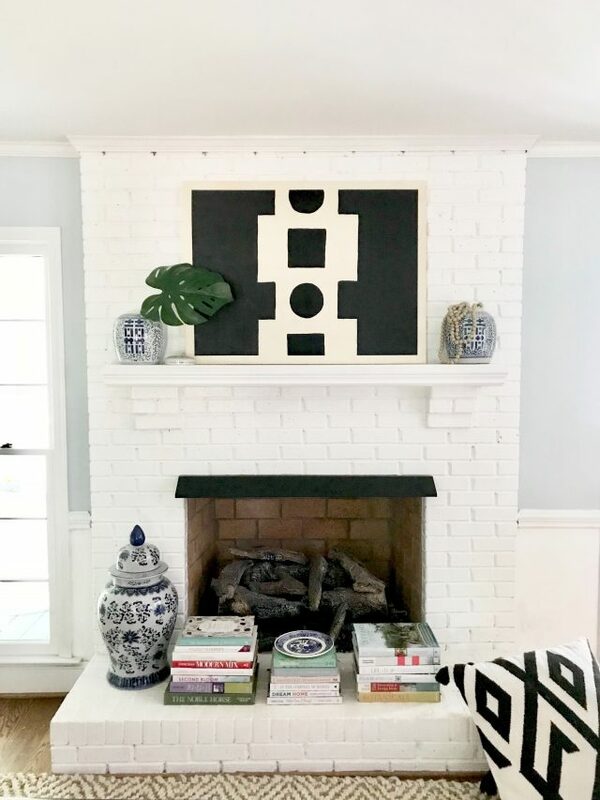 See the before/after pics and how I painted the brick white here. If you struggle with accessorizing, this look is the easiest to accomplish. 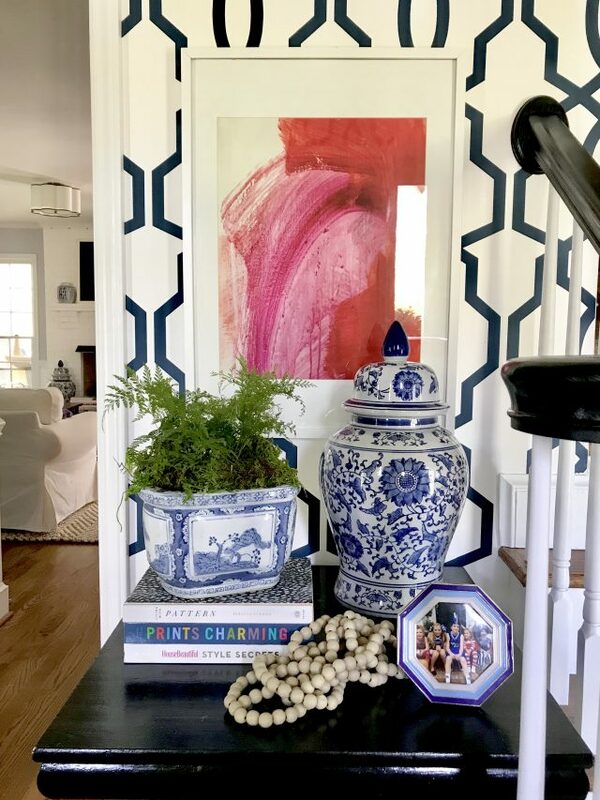 I’m obviously a fan of blue and white jars (with some beads and a green leaf thrown in), but a pair of topiaries or ceramic birds or vases can work, too. The focus here is more on the art. 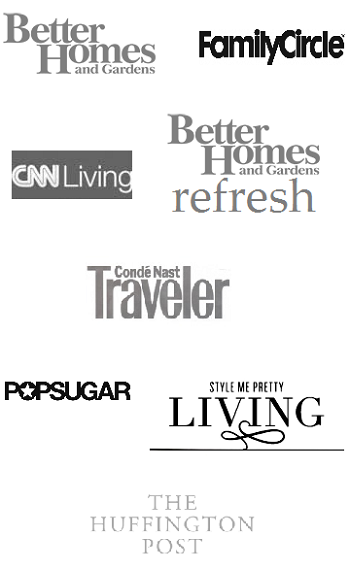 I’m a fan of the collected look, but the trick is to make it look as effortless as possible. 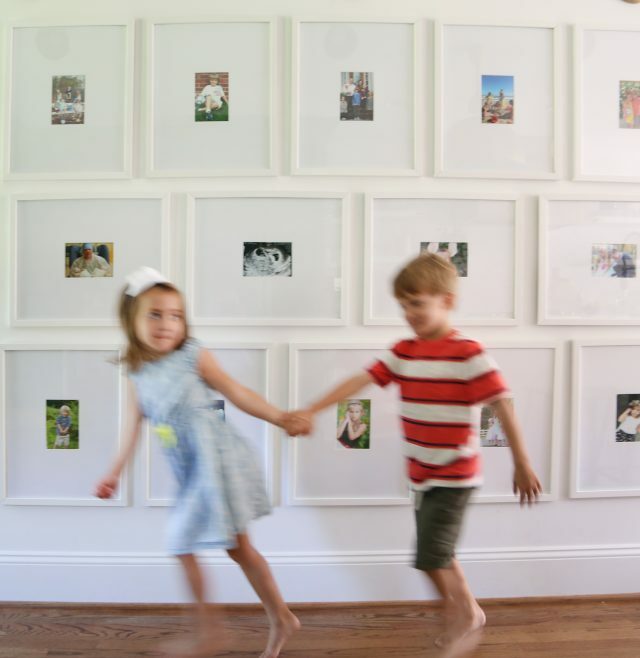 Mix things up by using different frames (hang one, lean some, mix in a canvas, etc.) and keep accessories minimal. I like how they’ve used a couple of substantial pieces on the ends and nothing else. 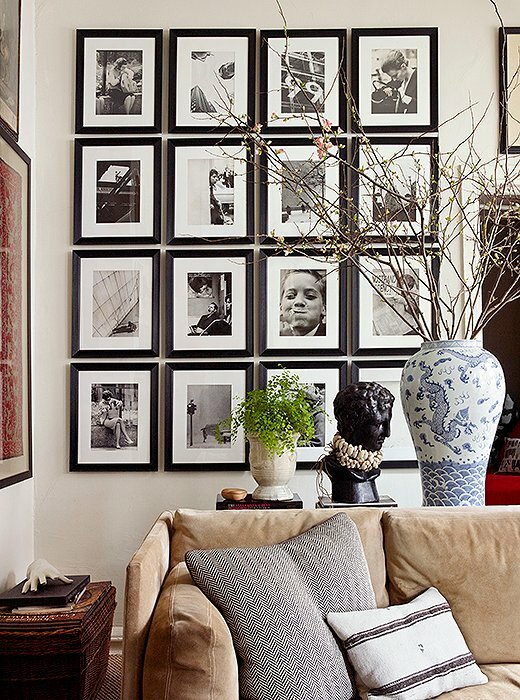 Another tip: If you’re worried about a collection looking too busy, keep the art neutral. 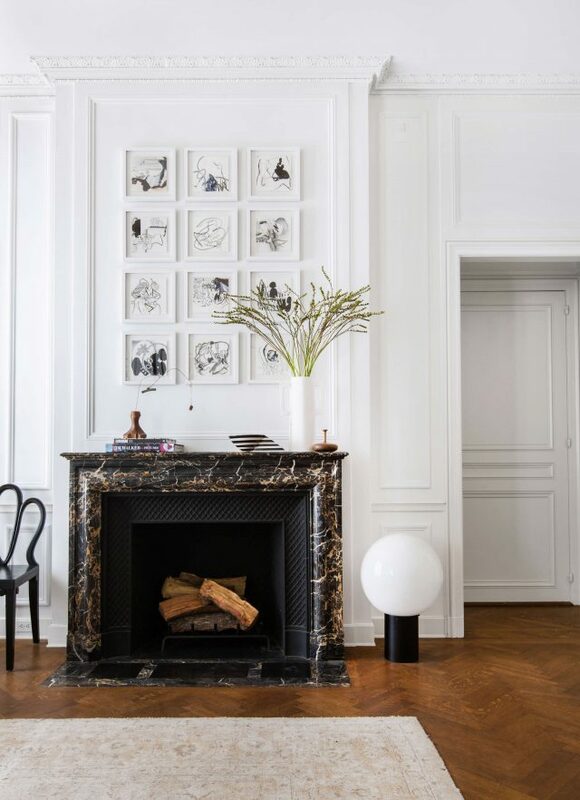 A gallery above the mantel is a great solution if you have higher ceilings and don’t want to invest in one huge piece of art. 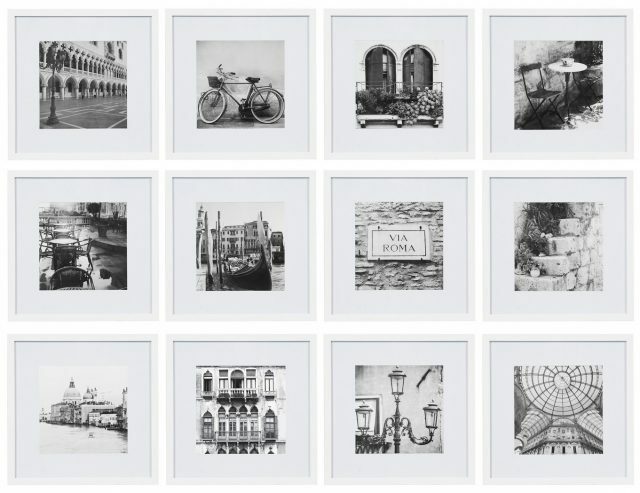 Etsy is a good source for affordable sets (many that you can even print and frame yourself). To balance out the clean lines of a grid, I’d keep the accessories minimal and asymmetrical using one larger piece on the end. 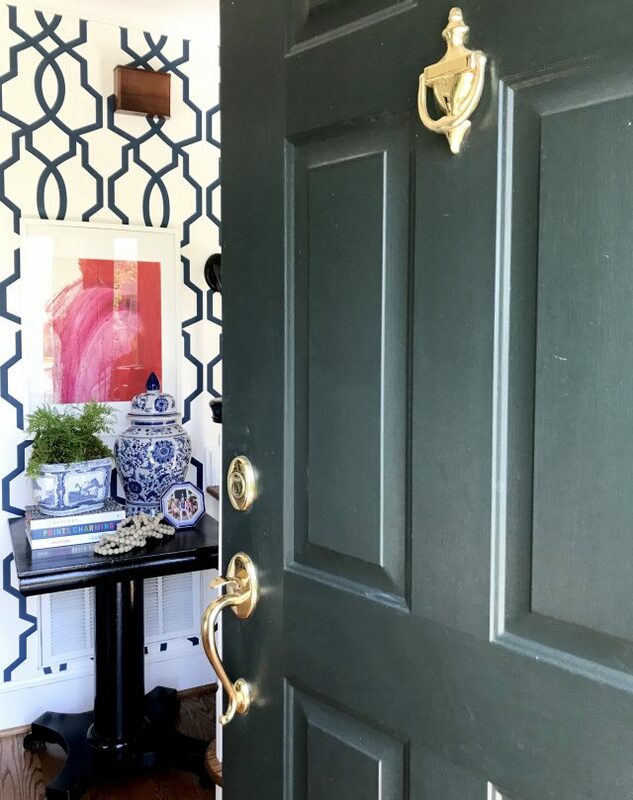 Nearly three years later and I think I have our small entryway wrapped up. I might not win any awards for speed, but sometimes getting things “right” is worth the wait. 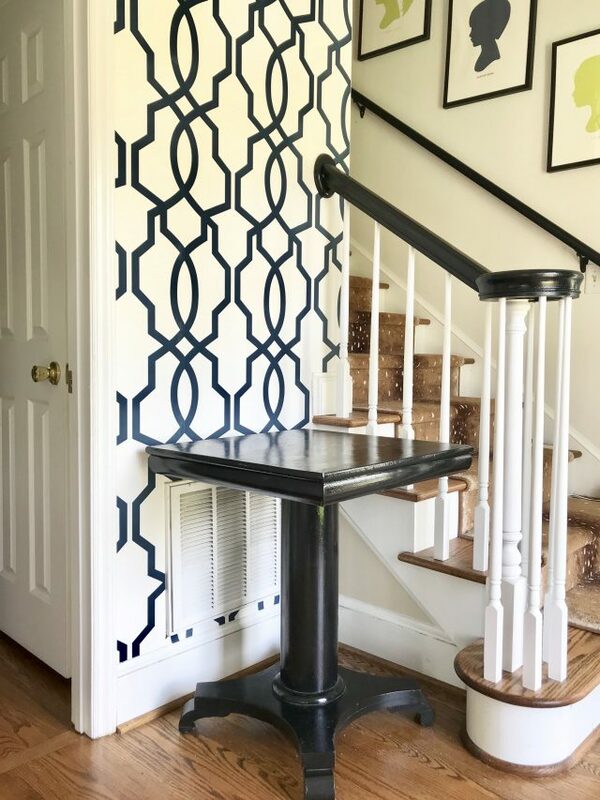 I (well, mostly my dad) wallpapered our entry early on and while I love all of the pattern, finding artwork has taken some time. This is the little wall that’s been in limbo. It’s literally the first thing you see when you come to our front door. (I’m sure the pizza man has been worried about it on his weekly visits.) 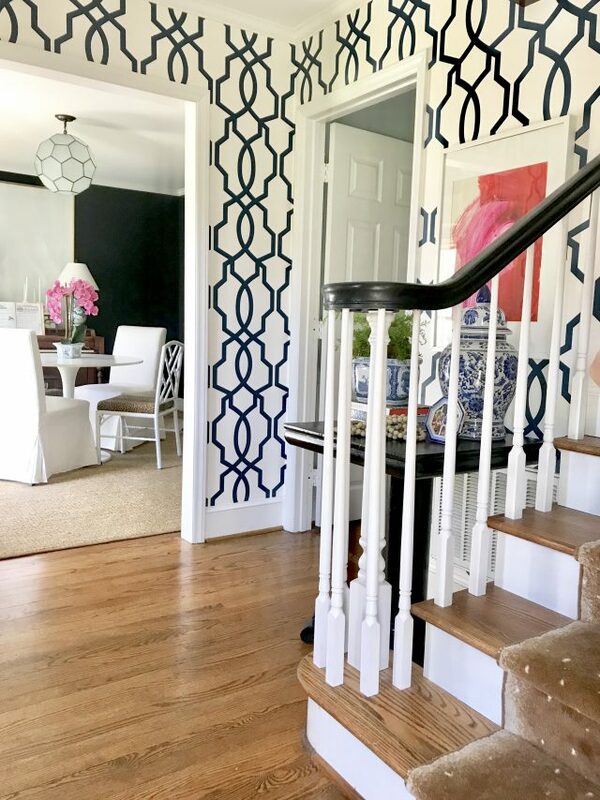 Although it’s a tiny space, there’s a lot to consider: the trellis pattern, the silhouettes leading up the stairs, the patterned stair runner and the fact that you can see three other rooms from this spot. By the way, Minted continues to be one of my go-to sources for art. I love that you can find unique pieces from independent artists all over the world. You won’t find work that you see in mass production everywhere else. 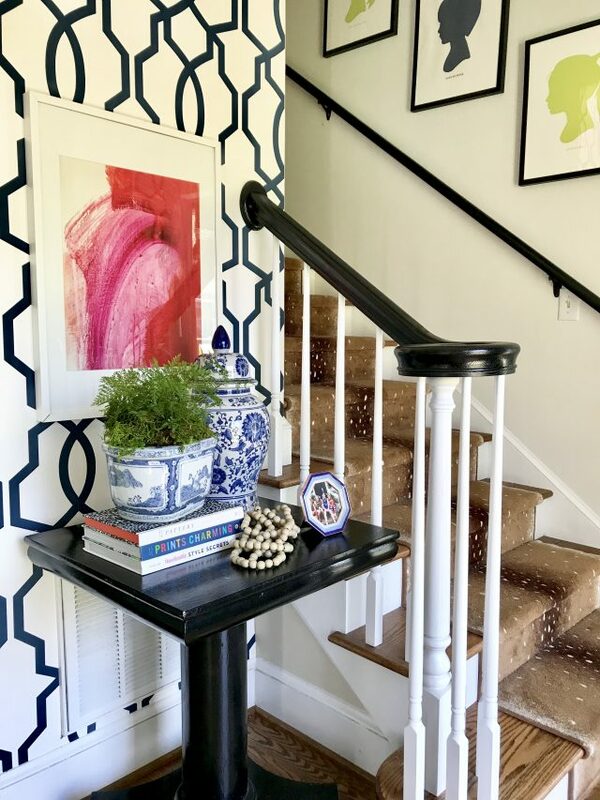 A few tips for pairing artwork with patterned wallpaper. 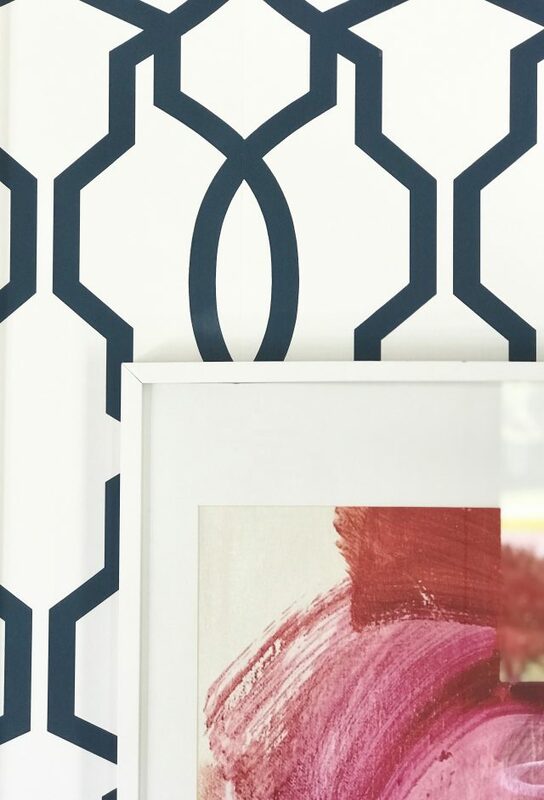 . .
Abstract art works well with a busy geometric wallpaper since the patterns “flow” differently. I like that these sets that are sold as groups of six or nine. 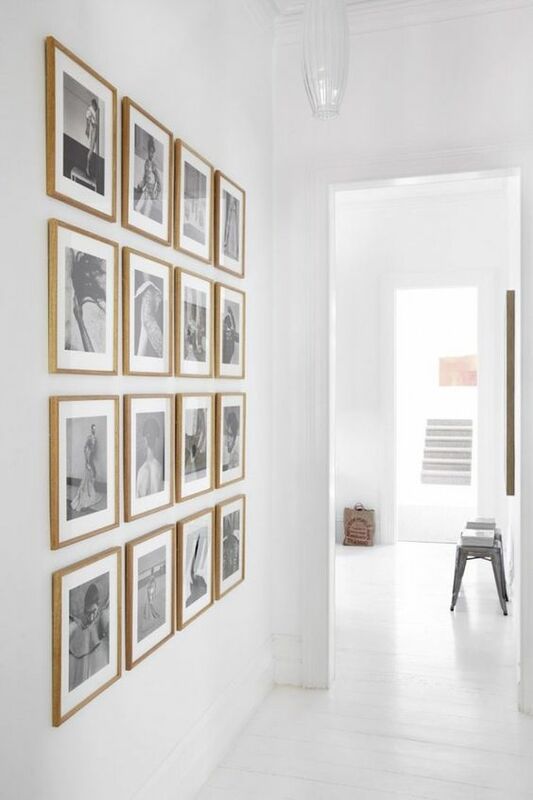 (Or double up for a huge statement wall!) When you break down the cost, they end up being between $5 to $8 per frame. 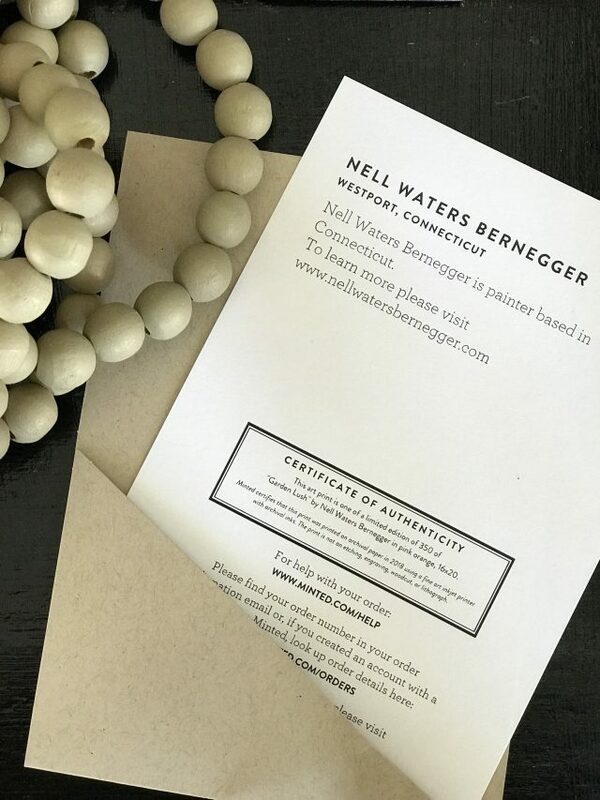 Not bad when the mat is included–and the square ones are perfect for favorite Instagram photos. They come in both black and white (or would be easy to spray paint gold). A quick tip: I like to measure or tape off the entire space I want to cover on my wall first and then plan my frame spacing accordingly. As a frame of reference, the frames on my wall are spaced approximately 2 inches apart horizontally and 1.5 inches apart vertically. (I say “approximately” because I eyeball everything that I hang without measuring or marking first. I know, I know. 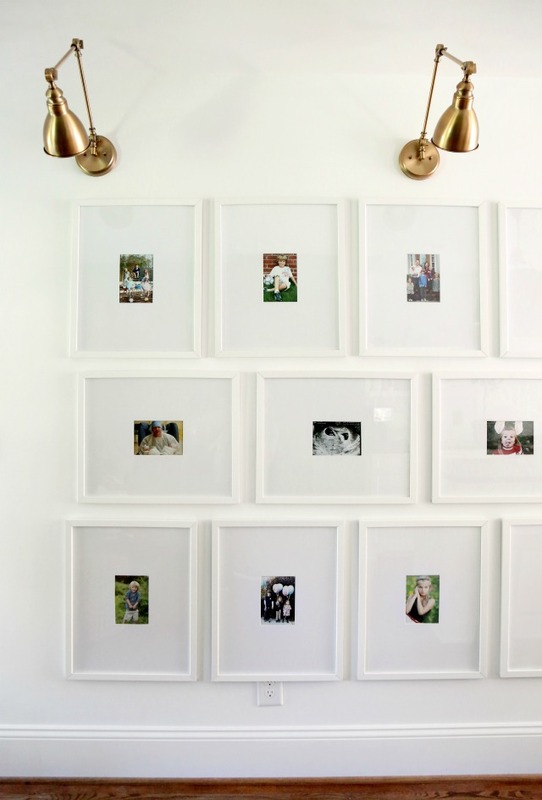 . .) I used these frames for our kitchen wall and really like them, but we did have to attach the hanger to each individual frame first. 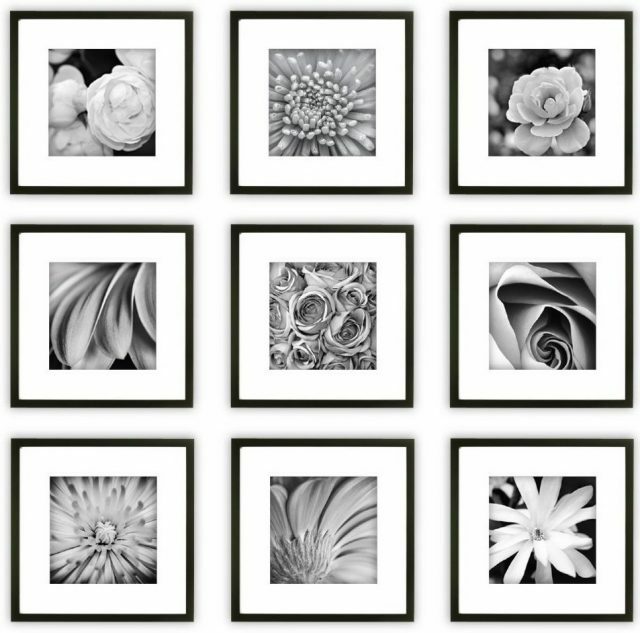 Looking for individual frames? I think this is one of the best looking gold frames for the price.